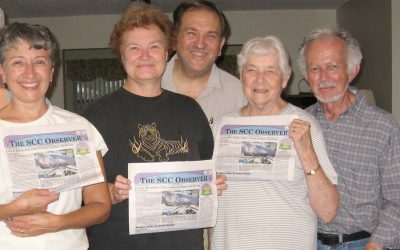 “It has been a great pleasure and joy bringing you your weekly SCC Observer in Kings Point for the past 13 years. We are also thankful for the many friends and relatives who have helped us when they came to visit us. We are also thankful to Beverly Kay and Alex Reid, and the rest of the people at M&M Printing, for making it a great place to work. But we have come to a point in our lives that we feel is time for us to move on,” said Frank and Edith. From left, Gwen DeBord, Edith Blaszczak, Frank Blaszczak, Nell Aldrich and Cleo Aldrich. The newspaper is dated 2007 and represents our close and faithful friends who were always there to give us a hand. Frank and Edith Blaszczak are retiring from their SCC Observer News home delivery route after 13 years. They have delivered the newspaper to approximately 1,900 customers every week. It began for them in January 2004, shortly after moving into Sun City Center in Kings Point. They initially started with approximately 700 to 800 customers. But within nine months they picked up two more routes in Kings Point. Within a year they eventually reached a total route of 2,400 customers. Frank and Edith were the first to deliver on a requested delivery basis in Kings Point. In order to get some order into their lives again, they gave up portions of their route several times, reducing it to about 1,600 customers. But, as the population grew in Kings Point, they eventually expanded back to 1,900 customers. So, after 676 weeks of bagging and delivering over 1,372,600 (that’s over one million!) papers, they came to the conclusion that it was someone else’s turn. The Observer News and M&M Printing Company are honored to have worked alongside such a dedicated couple. You will be greatly missed. We all wish you a happy, healthy re-retirement.